So I wanted to write a quick blog tonight before we head off to surgery tomorrow morning at 5:30am. Last week we had two appointments to discuss Emri's pectus (caved in chest wall). We went in to these doctors thinking that they would be wanting us to schedule Emri's pectus surgery next. However, when discussing Emri with them, and having them look at her and listen to her, they both said NO to a pectus surgery! We were thrilled to hear this...it was slightly stress inducing-- thinking about scheduling another surgery before we were even started with her spine. The pectus repair doctor that we saw did say that Emri's pectus was quite severe-one of the worst he has seen. But the good thing about that is that her pectus can't get much worse than it already is. He said that he anticipates her lungs to still be able to grow with her and function enough to keep her oxygenated as she gets bigger. Emri's breathing has progressively sped up in the last 2 years, but that is because the pectus has also been progressing with her growth. SO-if the pectus is as bad as it is going to get, we are hoping that her breathing will also not get any worse. I have to mention that in th emiddle of this appointment Emri kept saying "daddy, daddy, daddy!" until he finally acknowledged her. When he did, Emri took his hands, put them together and said, "I want to pray daddy." Talk about a tear jerking moment. So- while I was asking the last of my questions to the Doctor, Emri and Brett were quietly praying in the background. Sweet, sweet girl we have. The second doctor we saw was a pulmonologist that Dr. Dietz actually trained under...which was pleasing to us of course:) She agreed with the pectus repair doc that we should leave the pectus alone until it starts actually causing enough problems to get concerned. She also listened to Emri and heard her left lung inflate a few times. She ordered a chest x-ray and was pleased to see two lungs with air in them...no pockets of collapsed lung-which reassured her sending Emri into surgery. We were so happy to see those big beautiful lungs with air in both of them! Yesterday we had pre-op. We met with Emri's wonderful surgeon, Dr. Sponseller-head of pediatric orthopedics here at Hopkins. He explained the surgery to us and told us he would take good care of Emri. He did mention at one point that he had done a few other kids as young as Emri, which made me happy. He discussed the risks with us, which is never fun to listen to...but I kept my head steady-focusing on the fact that God is in control and HE has our precious girl in HIS hand. We met with Anesthesia after Sponseller. They made sure to let us know that Emri is indeed a very unique case and that they were making sure to cover all of their bases with her. We discussed her sudden drop in blood pressure during her last g-tube surgery which was, of course, concerning to them. They did emphasize that they have seen many many marfan cases and even some infantile cases. But we know that every case is unique and takes a specialized plan from the team of doctors, surgeons, and anesthesiologists involved in the case. Today was "Dietz day"-I am working on getting it coined as a national holiday. Ha! We had Emri's echo first and then met with Dietz afterwards. Emri's echo looked great in the sense that it had not changed at all from the last echo! We were SO relieved and happy to hear this! I know Dietz loves to see good results like this too-- knowing the medication and the dosage he is giving Emri appears to be working! He was once again, so so sweet with Emri and even stopped to chat with us in the waiting room, along with his wonderful assistants, Gretchen and Libby. After Dietz walked away from talking with us in the waiting room, Emri piped up and said, "He is a good man" out of nowhere! Tell me that isn't hilarious??!? What a clown. Throughout all of these appointments our sweet "baby Abee" has been an amazing, amazing baby. What a little blessing he is to us. He is currently spending the night with Grandpa and Grandma Van Andel in order to let Brett, Emri and I have a good night of sleep before surgery. We will see if I can actually shut my mind off enough to fall asleep! We have given Emri her bath, sanitized her surgery site, and put her to bed. It is so hard knowing what she is going to have to wake up and face in the morning. Emri has, once again, been such a trooper this whole trip. She continues to charm every doctor, nurse, and fellow Ronald McDonald housemate she meets. I am certainly nervous to send her into that surgery room tomorrow, but delight in the fact that God is in complete control of the situation. I dread the pain my sweet girl will have to endure from this...but pray that God makes recovery quick and as relatively painless as it can be. To be completely honest-my prayer the last few days has just been for God to allow Emri to make it through this all-to feel her warm bear hugs again, and to hear that sweet little voice sing "I Yove you Yord". This would all make me one happy and thankful mommy. 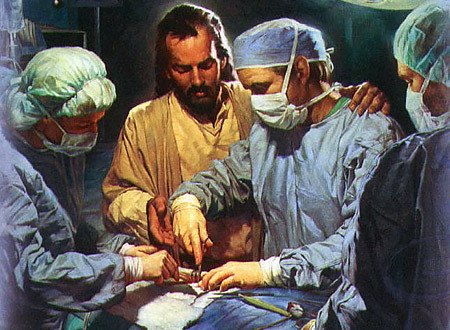 Praying that the Lord will guide the surgeons hand tomorrow and keep our hearts at peace. Thank you to everyone who is praying right along with us. This is the picture that I will be focusing on tomorrow while I wait the 4-6 hours during Emri's surgery. May be a bit "idealistic" but I can't help but find comfort in it. "Is anyone among you suffering? Let him pray. Is anyone cheerful? Let him sing praise. Is anyone among you sick? Let him call for the elders of the church, and let them pray over him, anointing him with oil in the name of the Lord. And the prayer of faith will save the one who is sick, and the Lord will raise him up. And if he has committed sins, he will be forgiven. Therefore, confess your sins to one another and pray for one another, that you may be healed. The prayer of a righteous person has great power as it is working." Keeping you all in my thoughts and prayers! You are the most awesome of places! My son had this surgery done when he was almost two years old, by Dr. Sponsellor. They are our team! If you have any questions please dont hesitate to ask me! Caden turned twelve in October, but I remember it as though it were yesterday. We visit Dr. Dietz yearly as we travel out for Cadens spinal adjustment...I think we know every hall if those buildings! Please tell them that Caden says hello! Again, if you have any questions dont hesitate to contact me.